distribution Essentially statewide, lacking records now for just two mountain counties. Certainly is present in all 100 counties. abundance Common, to locally abundant, in the Coastal Plain; common in the eastern and central Piedmont; somewhat less numerous (fairly common, at least locally) in the western Piedmont and lower mountains. This is one of the most numerous dragonflies in swamps and bottomlands. flight Early May (very rarely in late April) into late September in the Piedmont and into late October in the Coastal Plain. The mountain flight, quite a bit narrower, is from mid-May to mid-September. habitat Still or slow-moving waters in mostly shaded areas, such as swamps and swampy pools, wooded beaver ponds, and very slow-moving streams. behavior Males commonly perch around the margins of swampy pools and other wet areas in swamps and bottomlands. Adults typically stay close to forested areas, such as along roads through bottomlands and swamps. They usually perch on twigs of trees along the wooded edges, often 5-10' high. They can be quite pugnacious, with much chasing of other Great Blue Skimmers in their small territories. comments This is the largest of the Libellula skimmers, and though colored in pruinose pale blue like adult male Eastern Pondhawks and several other male skimmers, the male Great Blue Skimmer is separated by its very pale blue thorax (contrasting with the slightly darker abdomen) and greenish-blue eyes. They can occur in swarms of a dozen or more in a very small area. 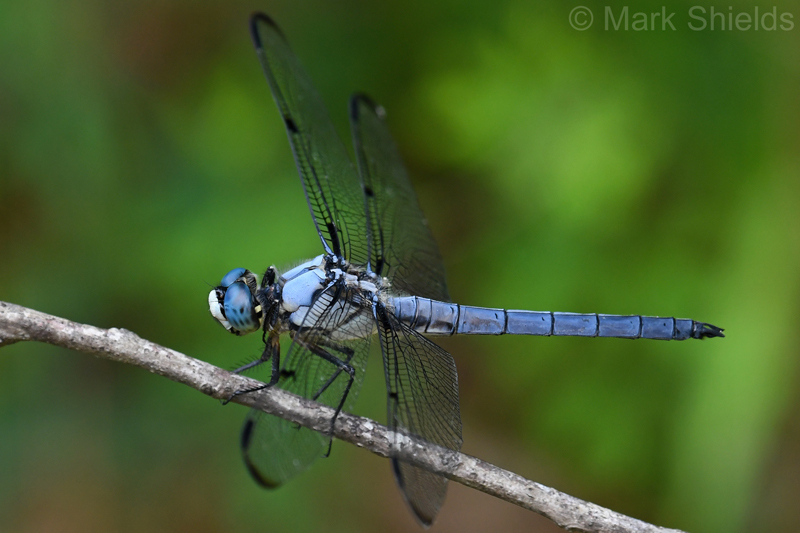 This species is one of the most common dragonflies (next to Eastern Pondhawk) that one sees along roads through swamps and bottomlands, especially as seen from bridges over swampy rivers and creeks. Comment: Robeson, 2017-05-27, Lumber River at the Boardman Boating Access on US Hwy. 74. - Remarkable numbers of females and immature males, mainly perched in trees at the parking area. Only 3 males with mature coloration seen. Comment: Dare; OBM, 2015-06-10, Buxton Woods Trail - Mulitple individuals seen but not counted. Comment: Tyrrell, 2015-06-06, Palmetto-Peartree Preserve - Multiple individuals seen but not counted.